You can use the physical Wing Mastercard® to eat, drink, and shop everywhere Mastercard is accepted. All you need is just one card. Experience more in your shopping sprees and dine outs! Shop to your heart’s content and treat your loved ones to lunch with just one card. The best part? 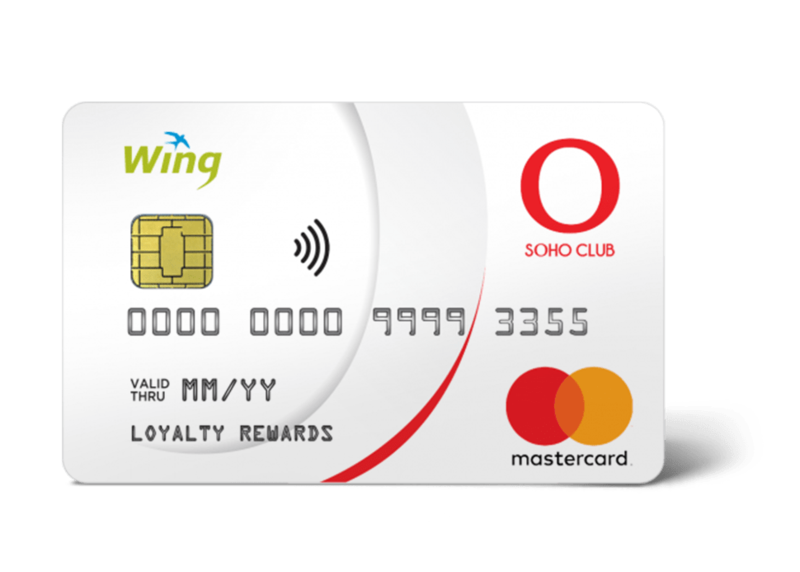 You can get exciting discounts, rewards, and perks when you use the SOHO Club Mastercard powered by Wing. What are you waiting for? Get yours today in selected SOHO stores now. Identity letter from local authority confirming, Full name, Gender, Date of birth, Place of birth and Address of the customer including photograph. The photograph must be permanence attached and stamped on. Get your FREE Wing account now at any Wing agent nationwide. Open a Wing account and get a SOHO Club Mastercard at selected SOHO stores. Register your account to the Wing App. Cash in at least $10 to your account. Scan QR code on the manual and complete necessary details. Choose which Wing account to link with your card. Set your Mastercard PIN and Wing PIN. Experience more in your shopping sprees, dine outs, and a whole lot more! Get discounts and hard to resist deals! All it takes is just one swipe! SOHO CLUB Mastercard membership to open all individuals 18 years or older. This program is intended for individual use only. This program is not valid for any existing discounted or promotional group items. Members shall be bound by all the terms and conditions contained herein and by all applicable laws. All discrepancies in the program terms and/or conditions shall be determined at the sole discretion of SOHO Diversified Holdings Co. Ltd.
Members earn one point for every dollar spent at any SOHO Club store. Points cannot be earned on tax, discounts, complimentary purchases, gift card redemptions or reward redemptions. Points will only be issued to members who pay the full bill. Points can only be earned at the time of the purchase. No points will be awarded to any guest receipt or other proof of purchase presented after the time of visit. Points can only be redeemed at a SOHO CLUB store location and updated redemption rules will be published at SOHOCLUB.COM.KH. Other rules and restrictions may apply. All points are valid for 12 months from the date of issue, and all earned rewards are valid for 12 month from the date of reward. Unused points and earned rewards will expire 12 months from the date of issue or the date of reward, as applicable. Expired points and rewards will not be extended or reinstated. Deferring points and rewards does not delay expiration. SOHO Diversified Holdings Co. Ltd. reserves the right, in its sole discretion, to modify the program terms, conditions, and rewards without notice, or to terminate the program at any time upon 30 days notice. SOHO Diversified Holdings Co. Ltd. reserves the right to change membership fees or membership requirements and benefits at any time.